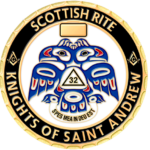 The Knights of St. Andrew is a service group whose active membership is made up of 32nd Degree Scottish Rite Masons (black hats). Knights Commander of the Court of Honor and 33rd Degree Scottish Rite Masons can join as honorary members, but cannot take leadership roles nor vote in KSA elections. Similarly, any active member of the Juneau KSA chosen for honors must resign his active membership in favor of an honorary one. Each Chapter has its own dress code, officer titles and ways of serving. In Juneau, the KSA is led by a Cheiftain and incorporates the Universal Masonic Tartan into its dress. Its logo is a stylized Scottish Rite double-headed eagle drawn by one of our founding members, Michael Franks. The Juneau Chapter has served as ushers and workers at Scottish Rite Reunions, cared for the Masonic section of the Douglas Cemetery, rung bells for the Salvation Army, and helped the Juneau Pipe Band with its Rabbie Burns Night events. For more on the KSA, please visit scottishrite.org/members/knights-st-andrew.